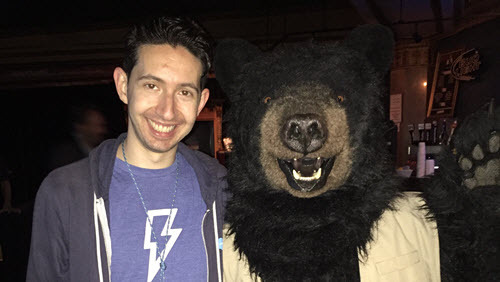 In our second blog series of Incredible Salesforce Certification stories, Adam shares how the Salesforce community—along with some good timing and good luck—led him to be an MVP with 12 certifications under his belt and an eye on becoming a CTA. A couple of years after graduating in 2014, I wasn’t happy with my career. I didn’t feel like I had an idea of what I “wanted to do with my life.” I had a pretty decent job but didn’t necessarily love it, and despite my engineering degree with Computer Science knowledge, I wasn’t doing any development on a day-to-day basis. They say in order to be successful, you need both luck and timing, and I was fortunate enough to get both of these in the Summer of 2014. I was doing a grad school program remotely at Carnegie Mellon and taking a Cloud Computing class where I had the good fortune of getting Adam Seligman as a guest speaker. Just two weeks later, I started a new role as a Senior Systems Analyst working with a program called Salesforce. I knew very little about it, other than what I had heard from Adam and that it had something to do with CRM (whatever that was!). Shortly after starting this role, my luck continued and I was chosen to represent my company at Dreamforce to help me learn about the new product I would be supporting. 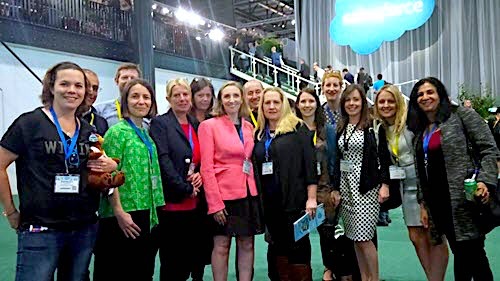 There were three sessions at Dreamforce '14 that really changed my life. The first two were both Hands-On Training (HOT) sessions: a Point-and-Click declarative session and an Intro to Apex session. Having previously done some Java coding in college, it all made perfect sense to me. I loved doing them and was able to get through them both relatively quickly. This gave me a lot of confidence that Salesforce would be a product I’d really enjoy working with. The third session I attended, and probably most life changing, was a theater session by David Liu, a self-taught Salesforce developer who worked at my dream company, Google. He talked about his website and how once he became Salesforce certified, his career took off. I was hooked—I finally knew what I wanted my career path to be. At the time, I wasn't aware of the newly released Trailhead, so I set out to work with the tools that WERE available to me, including the Salesforce Developer Force.com Workbook. As luck would have it (again) my company was a Premier customer, and therefore I was able to take advantage of Salesforce University's amazing virtual Help & Training courses (I highly recommend these if you can’t make it to the in-person ones!) to learn everything I could about Salesforce. In the last couple months of 2014 and the first couple of months of 2015, I spent most of my free time studying and reviewing, in part due to a challenge I set for myself after hearing about someone who completed 5 certifications in 6 weeks. With all of these resources, together with some guidance from David's website, I was able to pass my Salesforce Certified Administrator exam. I followed that up with the Force.com Developer and Advanced Administrator exams, and then did a deeper dive on Sales and Service Clouds to capture those certs as well. I had met my certification goal! After this achievement, I switched gears and started focusing on studying Apex and Visualforce, knowing that it would be a MAJOR step forward for my career to land the coveted Advanced Developer certification. After a few additional months of studying (and admittedly a few failed attempts), I passed the Multiple Choice exam and was a programming assignment away from my next goal. 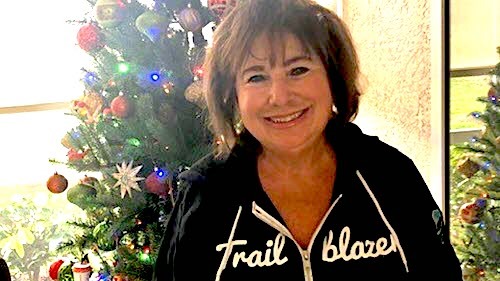 I continued to gain experience and was able to land an awesome job as a full-time Salesforce developer—just under a year from when I started my Salesforce journey. I had accomplished a great deal in a short space of time, but I wasn’t ready to stop learning. I had recently discovered Trailhead and continued learning all I could with the help of modules and additional Salesforce U courses. I also began to get more active in the community through Twitter, volunteering, writing blog posts, answering some Success Community questions, and attending as many events as I could. I had many different people helping me out, and even ended up getting selected to present at my second Dreamforce (proud much?). Shortly after Dreamforce 2015, the Advanced Developer programming assignment went live and I spent the month of November 2015 diligently working at that. Then I decided to take a little time off, but not before transitioning my Force.com Developer cert to Platform App Builder. In the first couple of months of 2016, I found out that my hard work had paid off and I had passed my Advanced Developer exam. I followed this up by converting it to the Platform Developer I and II certs, as well as taking the first steps on my goal of becoming a Certified Technical Architect. I passed two of the beta exams, Development Lifecycle & Deployment Designer, and the Sharing and Visibility Designer certs. This was by no means easy, but I looked at it as a time and financial investment in myself. It paid off again with another step up in my career, the chance to get my foot in the door with my dream company, Google, as a contractor with YouTube. Shortly after that, I was also named a Salesforce MVP, just two years after my first-ever Salesforce login. 1. Never stop learning. Especially with the speed of the technology industry today. 2. Get certified. Today is a great day to take the first step toward your next goal. As I look forward to the rest of 2017—making significantly more than my 2014 salary (proving my investment has paid off)—I’m still not done learning. As Salesforce continues to grow, I would love to grow with it. I want to take advantage of not only the new Trailhead badges, but get my feet wet with new technology and dive deeper into the products with Salesforce University training. I also want to achieve Salesforce certifications to enhance my resume (I've already added another two certs to my portfolio this year), with my ultimate goal to become a true Salesforce master and reach the coveted level of Salesforce Certified Technical Architect. Oh, and get my #dreamjob, too—watch out Google, here I come! 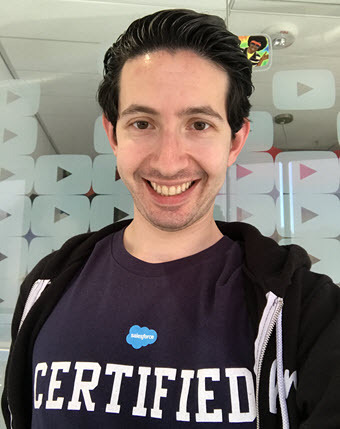 If you’ve been inspired by Adam's story, learn more about how you, too, can become a Salesforce Certified Professional.